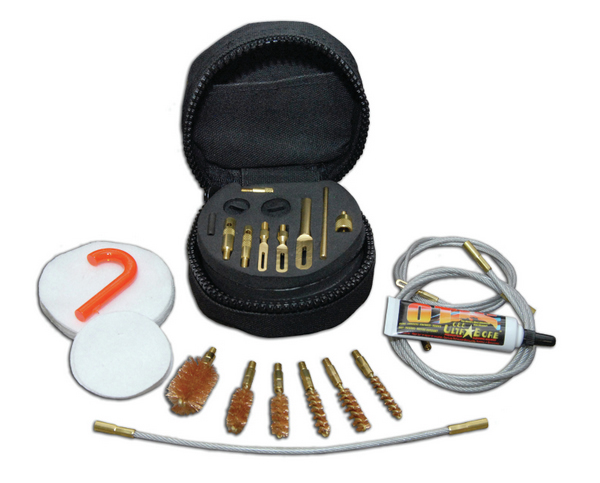 OTIS has engineered the most popular firearm cleaning system on the market today. The Tactical Cleaning System was engineered for the shooter who has a variety of firearms. This kit has essential tools to clean rifles .17 to .50 calibre, handguns .17 to .50 calibre, shotguns .410 to 12/10 gauge, and all in-line muzzleloaders. The system includes three Memory-Flex cleaning rods with over 750lb tensile strength, three forged slotted brass tips, two obstruction removers to knock out obstructions such as mud, snow, or even a stuck bullet or case , a T-handle attachment for added comfort, .5oz. tube of OTIS 085 Ultra Bore cleaner lubricant and preservative, all-calibre cotton cleaning patches for .223 calibre (5.56mm) and larger, small calibre patches for .17 to .223 calibre (5.56mm), shotgun brush adapter and rubber Patch Savers to get 360 degree coverage in your shotgun barrels, six high quality bore brushes, and a bore reflector/flag safety. Also included is a NATO adaptor to allow you to connect to Military cleaning attachments.